A Formula For The Perfect Bacon Sandwich | OhGizmo! Looks like there really are people stupid enough to grant researchers funding to determine formulas for the strangest things. Last time we covered this, it was a Russian-American scientist who claimed to have developed a formula for laughter. Yeah, fun. 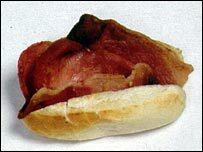 This time around it’s not one but four British researchers at Leeds University’s Department of Food Science looking for the formula for the perfect bacon butty (popular in the UK, similar to a BLT). That’s right: four educated dudes who spent more than 1,000 hours testing 700 variations on the traditional bacon sandwich. N = force in Newtons required to break the cooked bacon. fb = function of the bacon type. fc = function of the condiment/filling effect. ta = time or duration of application of condiment/filling. C = Newtons required to break uncooked bacon. Way to spend your students’ tuition, guys!